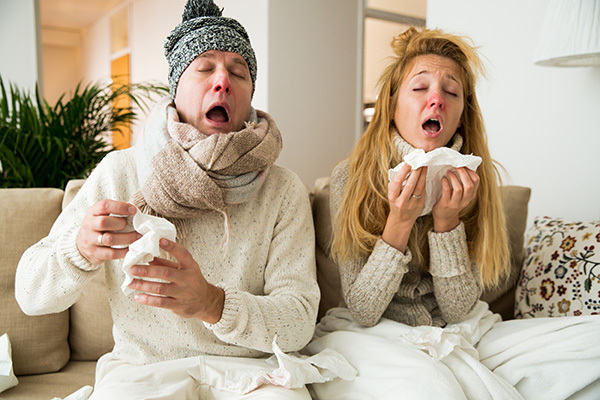 A cold is a mild viral infection of the nose, throat, sinuses and upper airways. It's very common and usually clears up on its own within a week or two. Symptoms of a cold include a sore throat, a blocked or runny nose, sneezing and a cough. You can also get a fever and muscle aches. If you or your child has a cold, there's usually no need to see your GP. It will clear up on its own and antibiotics are of no use. You can help yourself at home by resting and drinking plenty of fluids, taking over-the-counter painkillers, such as paracetamol and using over-the-counter decongestant sprays or tablets to relieve a blocked nose. Your child is under three months old and has a temperature of 38°C (100.4°F) or above, or is between three and six months old and has a temperature of 39°C (102.2°F) or above.